Ahab had his white whale, I have my beavers. 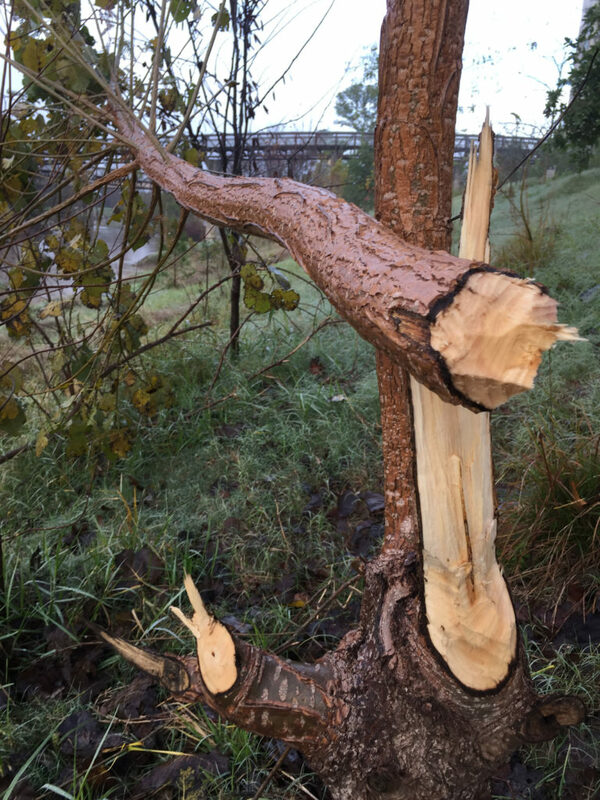 There are a pair (at least) of beavers living on Buffalo Bayou. I have seen them in the Park a few times, once on land feeding and several times swimming (the beavers, not me). When I started this blog, I couldn’t wait to write about the beavers. I just needed a photo of a beaver in the Park. In my fantasy, the skyline would be in the background. That photo would sum up in a single image what I love most about Houston. We are a vibrant, bustling metropolis that is so full of nature that we can host a pair of beavers within spitting distance of downtown. The thing with beavers is that it’s a lot easier to see where they’ve been than to figure out where they’ll be. 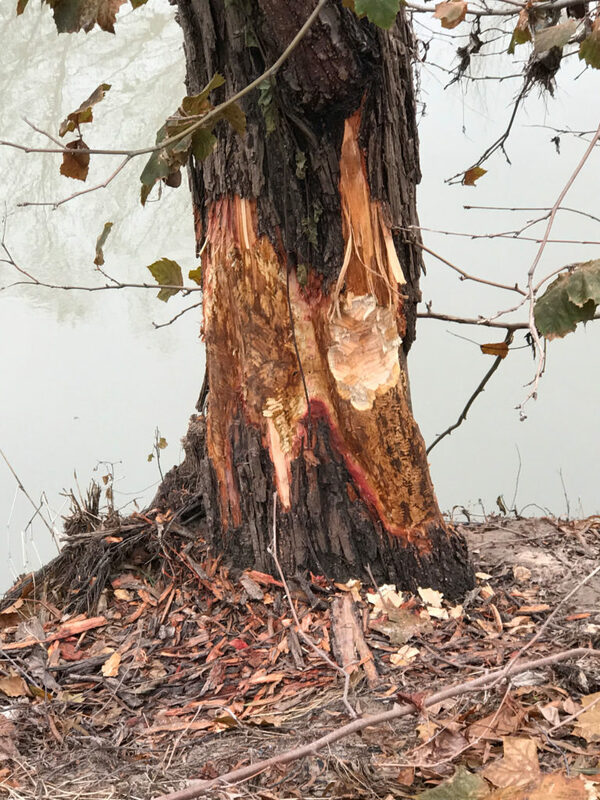 I document all the beaver damage I run into as I spend time in the park. And I revisit places at night (when our beavers seem to be most active) hoping they will return. Sometimes, they do. But it’s hard to take photos in the dark. So I have surrendered. This is my beaver post and the only photos I can share are of the trees they have eaten and the prints they have left in the mud. One of them does have a skyline in the background though. Most of my observations have been in the winter months. I think this has less to do with the habits of our beavers than that this is when I train for the half marathon and because of training, I cover a lot more ground each time I’m in the Park. 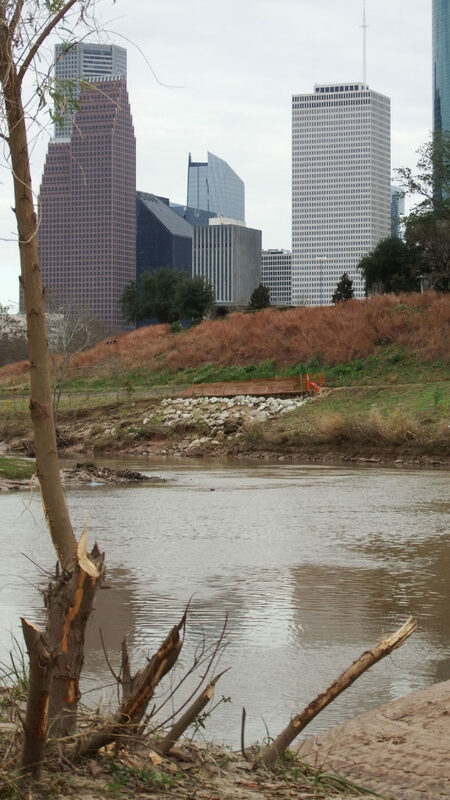 Our beavers will not be damming up Buffalo Bayou. They make their home in the bank with an underwater entrance and a second exit above ground that allows air to circulate. I suspect that they live west of the Park. 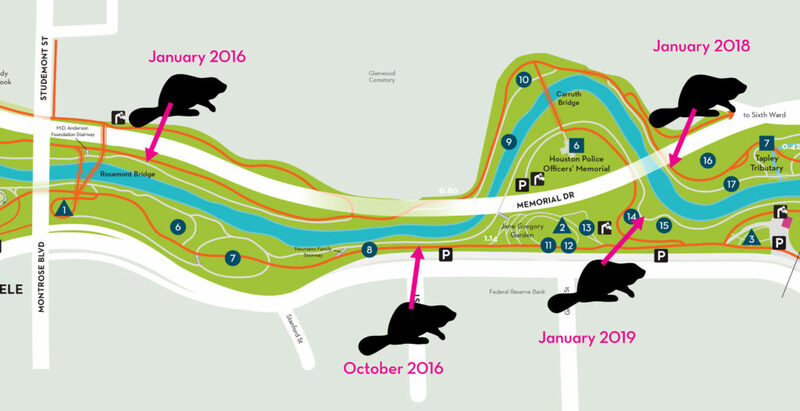 On iNaturalist, there have been seven beaver reports along Buffalo Bayou, all of them west of the loop. And that made me realize that I have to post my sightings, which will raise the number to 11. 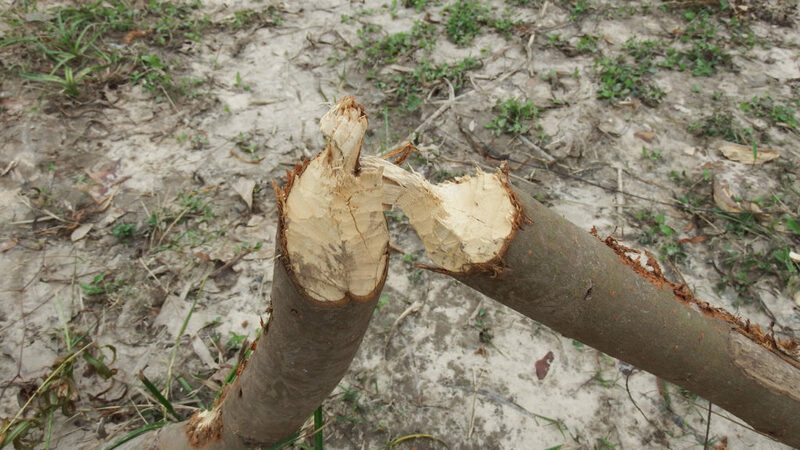 The beavers are fond of sycamore saplings. This sapling was taken in 2016 near Studemont. You can see the Rosemont bridge in the background. The park had just planted lots of saplings and the beavers got more than a few. I have also been told of beaver sightings on the bayou near UHD. This black willow is the largest tree our beavers have fed on. Black willows seem to be our beavers’ favorite food. The photo was taken in 2018. The tree with the damage is still there. They actually eat the trees. They don’t just cut them down for building material. They have a special sac (a cecum) between their large and small intestines. This sac holds enzymes that help beavers digest all that wood. As with all rodents, their incisors (front teeth) continue to grow throughout their lives. 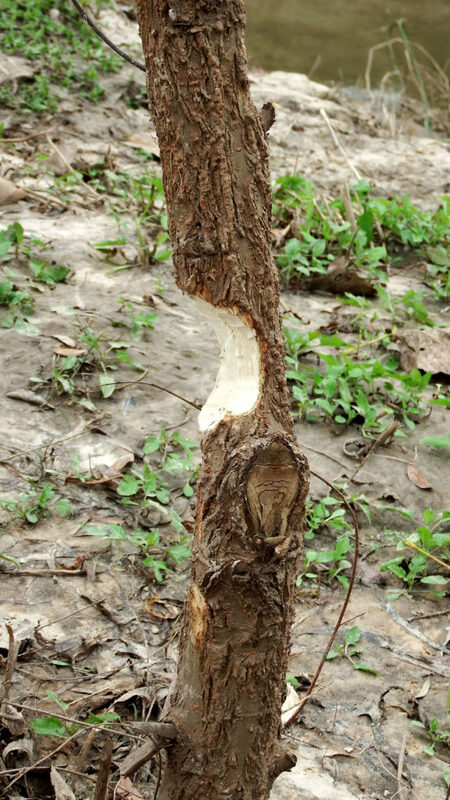 The tree felling helps to curtail this growth and helps keep their teeth very sharp. Beaver incisors are orange on the layer facing out because the enamel on this side contains iron. There is no iron in the enamel on the inside of their teeth. Because of this disparity, the fronts of their incisors don’t wear away as fast as the backs resulting in a self-sharpening tooth. This artfully chomped black willow sapling was eaten last week. Beavers are the largest rodents in North America and the second largest in the world. They average 45 pounds. These are beaver tracks. The back foot is webbed and over 7 inches long. The front foot is considerably smaller. These prints were photographed last week. 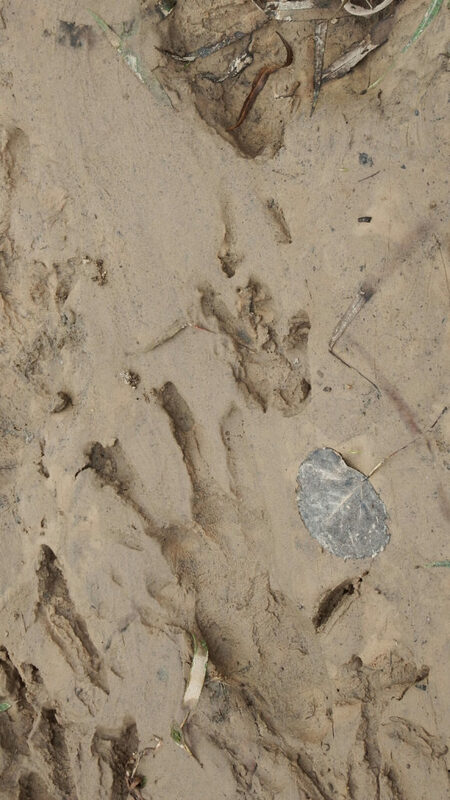 The prints are somewhat obscured, I think because the beaver’s large heavy tail dragged over them. They mate for life, so here’s hoping the pair I saw last year have had a kit or two by now. Beavers can live up to 20 years and often form colonies with their offspring. Classic beaver chomp. Black willow sapling. Taken last week.